Man, I'm sorry to sound like a fanboy, but that is one sweet weapon. Is that a custom blade or is it for sale somewhere? Can anyone tell me if the hilt on Jake's seax would be historically accurate for the Beagnoth blade? I really like that style and would love to have my seax sport something similar, but I am also going for accuracy. On another note, the Jake Powning Anglo-Saxon seax is absolutely beautiful. Most examples I've seen of a Leangseax (spelling?) have just a simple wooden grip- no apparent pommel or cross. The one Randal Graham did for Albion had a full viking sword hilt. Was this a common practice? Are there many surviving examples that exhibit this? Hello Jeremiah. 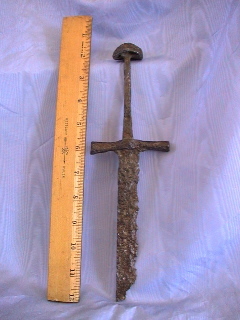 The full sword hilt langsax is accurate for the Viking period. 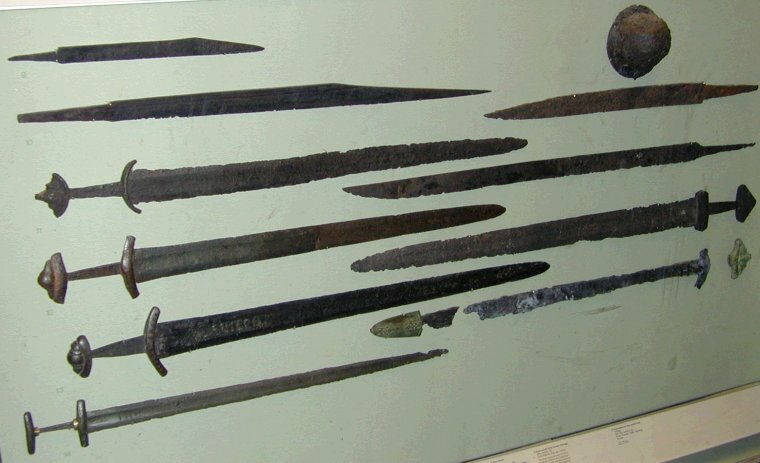 Here is another pic of Viking and Saxon lansaxes (along with a few swords). These no longer have their hilts, but they would have had full hilts. There's one pattern in there that I haven't seen anyone take a crack at- the one on the right side, second from the top, with a somewhat rounded tip- almost like a 'proto-backsword'! Thanks for the info, Jay. That cleared a few things up for me. The saex is believed by many to be a relative of the Greek Kopis, and the earliest knives that I have seen referred to as saex seem very like a Kopis, but with a straight blade. This is not far-fetched, as the Greeks did trade overland with the peoples of Northwestern Europe during the Classical Period (around 500BC.) The handles of these weapons had scales of organic material of various types riveted to the full-width scales. I have veiwed very few saex personally, and all were in museums in Germany over 20 years ago, except for examples of very small (3-7 inch blade) handsaex that I looked at last weekend in Mark Gaukler's collection- none of which had any remnants of hilt fittings. They were for the most part typical of later medieval knives called Thwittles, having a narrow tang tapering towards the tip that would extend 1/2-3/4 of what you would expect the length of the handle to be. It would be reasonable to suppose that these would be mounted very like these later knives, with the narrow tang 'burned in' to the handle, glued or simply force-fit to a handle with a shoulder band, rather like a modern file handle. This mounting method would be much less suitable for shortsword length weapons under discussion here, but I though it might be of interest. Just a little something you slapped together, eh Tinker? Very nice work! I'd be glad to have that one in my mitt when things get close & personal. For the late anglo saxon style of seax blade like the Beagnoth, the most accurate way to mount them is pretty much the way that Peter mounted his. Either with or without the metal collar... The next step down in accuracy would be something based on the image I posted earlier with the swell at the end. This we have no physical proof, but an artistic image to base the design upon. Beyond this, we are getting into designs as Tinker called his, historically plausible. Some of these are more so than others. Personally I don't care for this style of blade mounted with a Petersen type B,C,H, or I type of hilt, it seems stretching a bit for me personally. I have to agree with Shane- these style of hilt are more appropriate to longer continental styles, though I do get customers who request them on the clip-point styles as well. I usually break them down by size- a 'hand-sax' can be anywhere from 3-13 inches, anything from 14-24 I refer to as a scramasax (short sax) and the sword-like ones above 24 inches as simply a sax. That's sort of how Oakeshott broke them down, so it works for me. I'm not sure if I missed this in one of Peter's earlier posts, but how much (if any) distal taper did the Anglo Saxon scramasaxes have? I'm about to send my commission off to the smith and I should probably have that detail. I can't say for sure about all saxes, but I would certainly expect that saxes of sword proportions that are fitted up like swords would have sword-like distal tapers- with the possible exception of 'broken-back' clip-point style saxes, where I would expect distal taper only from the peak of the spine to the point. This is just an educated guess, of course- but these sword type-saex would be likely to have distal tapers similar to swords of their period.